Inspired by the equine imagery in Paul Ramirez Jonas’s “The Commons”, currently on view in the Bell Gallery’s Alumni Exhibition, we delved into the collections for more equestrian inspired pieces. 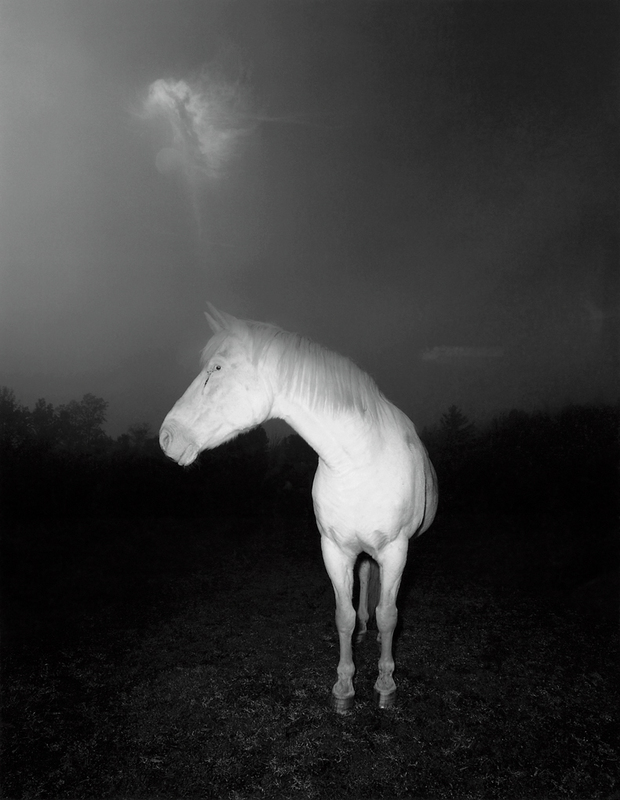 We were thrilled to find this multi-negative photograph, “White Horse in Fog”, taken by Doug Prince in the fall of 1979 while he was teaching at the Rhode Island School of Design. Coincidentally enough, there is a photograph of Prince taking the photo. While I was photographing, Lee came out and took a picture of me taking a photograph of the horse. When the flash of his camera went off, the horse turned his head to see where that light was coming from and I was able to capture the contrapposto posture that you see in this photograph. Later that year, going over contact sheets, I found an image of a cloud that I photographed over Moonstone Beach, RI. Prince practiced this multi-negative method for about four decades. He told us that the process allowed for “new possible realities” and that this image making lent itself to an easy transition into working digitally. I’ve come to appreciate my monitor as a viewfinder. The digital work environment is very different from the world of film and darkroom, but the creative process and vision has been rather consistent. Prince is currently a professor at the New Hampshire Institute of Art. View “White Horse in Fog” in the Bell Gallery’s digital collections database here. Welcome to Re: Bell, the outlet for responses to the exhibitions and collections of the David Winton Bell Gallery at Brown University. Re: Exhibitions features responses to our exhibitions written by student, faculty and occasional guest writers. Curator’s notes features notes on art works from the collections of the Bell Gallery. Follow the links above or below to our recent posts, or visit the Bell Gallery’s main website here: http://www.brown.edu/bellgallery.